D Feng, J Woytash. Diffuse pulmonary lymphangiomatosis in a 26-year-old man. The Internet Journal of Pulmonary Medicine. 2006 Volume 7 Number 2. Diffuse pulmonary lymphangiomatosis is a very uncommon disease, and is caused by abnormal development and proliferation of the lymphatic system. It is seen predominantly in children, exceptionally in adults, and affects both sexes equally. The diagnosis is usually made by biopsy. We report a case of a 26-year-old patient who presented with a 12 month history of progressive chronic cough and dyspnea. His chest CT image mimicked interstitial lung disease. Histopathologic examination showed marked thickening of the pleura with numerous dilated irregular thin-walled lymphatic vessels. The diagnosis was confirmed to be diffuse pulmonary lymphangiomatosis by lung tissue biopsy. Diffuse pulmonary lymphangiomatosis is a rare disease, and is caused by abnormal development, and proliferation of the lymphatic system. It is seen predominantly in children, exceptionally in adults, and affects both sexes equally. In most cases the disease progresses to serious morbidity or even death. Symptoms like dyspnea and cough, pulmonary function with restrictive pattern, and interstitial syndrome, are not specific. We report a rare case of diffuse pulmonary lymphangiomatosis in a 26-year-old patient presenting with a 12 month history of chronic cough and progressive shortness of breath. Imagining studies showed interstitial lung disease of unknown etiology. The lung tissue biopsy confirmed that the diagnosis was diffuse pulmonary lymphangiomatosis. A 26-year-old man was admitted to the hospital with a twelve month history of progressive chronic non-productive cough and dyspnea on exertion. His chest CT demonstrated interstitial lung disease of unknown etiology. A biopsy was performed and a wedge-shaped fragment of red tan lung tissue was sent to Pathology. The tissue was submitted entirely for microscopic examination. Histopathologic examination showed marked thickening of the pleura composed of multifocal proliferation of numerous dilated irregular spaces and channels. These spaces and channels were anastomosing with one another, and lined by attenuated endothelial cells reminiscent of lymphatic vessels. The lumina were empty and some contained proteinaceous material with occasional red blood cells (Figure 1). There was no proliferation of smooth muscle cells identified. The endothelial cells lining the spaces and channels were positive for anti-CD31 immunohistochemical staining (Figure 2). 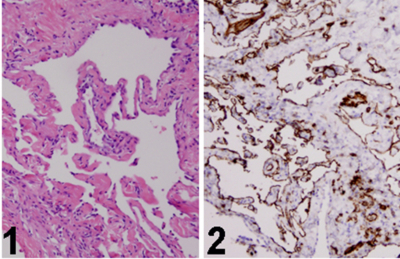 The pulmonary parenchyma was preserved and there were focal lymphocytic infiltrates with follicular formation. No distinctive solid masses were identified. The lesion was diagnosed to be diffuse pulmonary lymphangiomatosis by two pathologists. His past medical history and family history were unremarkable. Diseases of the pulmonary lymphatic system occur in a variety of clinical settings. Errors of development can lead to primary pulmonary lymphatic disorders that, when focal, are termed lymphangiomas, and when diffuse, are named lymphangiomatosis. The latter form is frequently associated with other lymphatic abnormalities that may involve multiple organ systems.1 It is unknown if other organ systems are involved in this patient. Diffuse pulmonary lymphangiomatosis is a rare pulmonary disorder affecting the lymphatic channels from the mediastinum to the pleura. The disease usually occurs in children and young adults, and frequently ends with death due to a progressive course. Only pathology is evocative, characterized primarily by multifocal proliferation of pulmonary lymphatic vessels and increased number of complex anastomosing channels. 1 Primary lymphatic disorders of the lung are rare, and their diagnosis and classification are difficult. The major differential diagnostic considerations of this case include lymphangioma, lymphangiomyomatosis, lymphangiectasis and cavernous hemangioma. Diffuse irregularly dilated lymphatic vessels in the pleura exclude lymphangioma, which is a localized lymphatic malformation, and usually shows no connection with the normal lymphatic system. Fluid may accumulate in these lymphatic malformations, and give them a cystic appearance. At this stage, they are called cystic hygroma. 2,3 Lymphangiomyomatosis generally affects women of reproductive age, and is characterized by a proliferation of interstitial lymphatics. It is caused by a proliferation of abnormal smooth muscle cells around airways and blood and lymphatic vessels resulting in obstruction and dilatation of these structures. This leads to air trapping, hemoptysis, and chylothorax, respectively.2,3 In this case, the airways and blood vessels are spared, and proliferative lymphatics were located in the pleura rather than in the pulmonary interstitial tissue. There was no proliferation of smooth muscle cells identified. The lymphangiomyomatosis can be ruled out in this young man. Common to both lymphangiectasis and lymphangiomatosis is that they might affect infants, children and young adults. They present with chylous effusion and dyspnea. A restrictive pattern is noted in pulmonary function tests. While existing lymphatic channels undergo dilatation with no new channels being formed in lymphangiectasis, new lymphatic channels appear in lymphangiomatosis and show abnormal dilatation.4 Unlike cavernous hemangioma, which is composed of more regularly dilated vessels filled with red blood cells, lymphangiomatosis consists of diffuse irregularly dilated thin-walled vessels, filled with amorphous proteinaceous lymphatic fluid. The authors thank Dr. G. Brink for review of the manuscript. 1. Faul JL, Berry GJ, Colby TV, Ruoss SJ, Walter MB, Rosen GD, et al.. Thoracic lymphangiomas, lymphangiectasis, lymphangiomatosis and lymphatic dysplasia syndrome. Am J Respir Crit Care Med 2000;161:1037-46. 2. Huaringa, AJ; Chittari, LM; Herzog, CE; Fanning, CV; Haro, M; Eftekhari, F: Pleuro-Pulmonary Lymphangiomatosis: Malignant Behavior of A Benign Disease. The Internet Journal of Pulmonary Medicine. 2005. Volume 5, Number 2. 3. Samantapudi K. Daya, Ramesh M. Gowda, Mamatha R. Gowda and Ijaz A. Khan Thoracic Cystic Lymphangioma (Cystic Hygroma): A Chest Pain Syndrome: A Case Report Angiology 2004; 55; 561. 4. Yekeler, E; Dursun, M; Yýldýrým, A; Tunacý, M. Diffuse pulmonary lymphangiomatosis: imaging findings. Diagnostic and Interventional Radiology, 2005; 11(1): 31-34. 5. Yang, DH and Goo, HW. Generalized lymphangiomatosis: Radiologic findings in three pediatric patients. Korean J Radiol 2006; 7: 287-291.